The femur, or thigh bone, and the pelvis make up the bones in the hip joint. The hip joint allows for the front-to-back and side-to-side motion that allows you to run, walk, and more. The top end of the femur is called the femoral head, while the thinner part of the femur just below it is called the femoral neck. A hip fracture is a condition in which there is a break of the femoral head or femoral neck. Hip fractures can be very serious injuries, as they can make movement painful or even impossible. 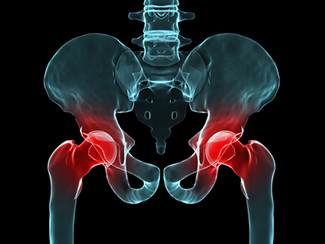 Hip fractures are caused by trauma to the hip. This condition can occur at any age if the trauma is very severe or if any other degenerative conditions are present. The severity of the trauma required to create a fracture can vary depending on factors like age and bone strength. The combination of degenerative conditions like osteoarthritis and traumatic injuries to the hip can increase the possibility of hip fractures. Conditions like osteoporosis may cause our bones to gradually lose strength and density as we age, which is why the elderly are more likely to suffer fractures as a result of a fall or other injury. Symptoms of a hip fracture can include severe hip pain, difficulty or inability to put weight on the affected leg, as well as swelling and bruising in the groin and hip area. In some cases, the injured leg may turn outwards or appear shorter. If your doctor suspects you may have a fractured hip, the diagnosis may be confirmed with imaging studies. Often, an X-ray will confirm the diagnosis, but an MRI may be needed if the fracture is not complete. Surgery is almost always the preferred treatment option when it comes to fractured hips. Surgical options may vary depending on your age, general health, the conditions severity and location, and other factors. Some options may include the use of screws, plates, or rods to hold the bones in the correct position. Other surgical options may use artificial implants or devices to replace the fractured bones, such as in a hemiarthroplasty or a total hip replacement.